Let's be very generous to this card an look at it from the point of view of early Netrunner: Jinteki is even poorer than the other corps, and Account Siphon is everywhere. If you're ever going to over-advance this card, it's going to be the first one you draw, early on when there's not much ice rezzed yet, and you can pretend it might be a Junebug or Fetal. Even then, you're risking a big setback if it's stolen after you spent two clicks and two credits on it. Purely for its economic drip/boost, that's arguably not worth it. What an over-advanced Braintrust does give you, however, is the ability to rez a select few pieces of ice despite having been siphoned down to zero credits; for early Jinteki, the most relevant ones are Chum, Ice Wall, Hunter and Snowflake. I don't know how extensively early Jinteki players experimented with using Braintrust along those lines, but it's likely over-advancing it simply proved too risky and unreliable for a viable strategy. Regardless, I'm fairly certain that this was the design intent behind it. 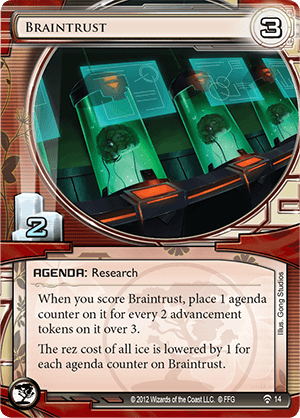 Possibly the least used agenda in all of Jinteki, Braintrust doesn’t give much bang for its buck. Requiring a double turn scoring window in order to get any bonus out of scoring it, and its effect is not going to be as needed once those ICE protecting it have been rezzed to keep that scoring window open. It is a three for two, which in a Fast Advance strategy is just what the doctor ordered - Some Jinteki have tried that approach, but it has never really caught on. It could be used for some crazy positional ICE Whirlpool Cell Portal infinite loop combo kill server, but the number of moving parts in there is simply so complicated, it is unlikely to ever be pulled off with any sort of consistency. It is possible that Braintrust would see more use with Fast Advance strategies out of Jinteki, a place where most players have not forged ahead - and that means for at least a little bit, it could be quite a surprise deck to see.